Is there anything better than this bar finger food classic? Whether tossed in a homemade Buffalo sauce and served on checkered paper or expertly charred with sweet-spicy glaze alongside fancy garniture, chicken wings have cemented themselves in culinary Americana. Even in sparsely populated, windswept Wyoming, the “hot” wing is as popular as ever. Here are the best places to get wings in the state. Wings and burgers and beer. Those are the specialties here. And this straightforward focus leads to some well-executed, tasty Americana. Bolstered by weekly food specials and daily happy hour, the chicken wing program is worth the visit. Sixteen distinct sauces and proper deep-frying make for an endlessly satisfying barrage. Spicy hounds will love traditional or Angry Buffalo, barbecue lovers will dig the bourbon-laced Texas Jack, and the mango habanero or Pineapple Sriracha balance savory and sweet. Founded over a decade ago in neighboring Colorado, this chicken shack blends a delicious variety of sauces with an attention to detail and dedication to the community. The no-nonsense menu is divided into simply categories (sides, chicken, fries) leaving all the frills to producing excellent chicken. The dozen sauces are all house-made, from scratch, daily, ranging from exotic Thai and Teriyaki to the mouth-magma known as “Bear Hot.” For the brave (or foolhardy), attempt the Bear Hot Challenge: ten excruciatingly-spicy wings in under five minutes. It’ll get you a hat, plaque and a lifetime of bragging rights (and indigestion). DownTurn perfects the hand tossed variety of wing-making: throwing the glistening morsel into the air with a buttery sheen of spicy sauce. This primo chicken (in regular, jumbo or boneless) is fried crisp and tossed with a choice of twelve house-made slathers. The sweet-salty glaze of teriyaki is a pleasing umami bomb every time; and “Toxic” is painfully fiery. No matter the flavor selection, the great in-house salads provide a perfect, fresh complement, and may alleviate some guilt after a couple dozen wings. Maybe. Wings upon wings. By the bucketful. 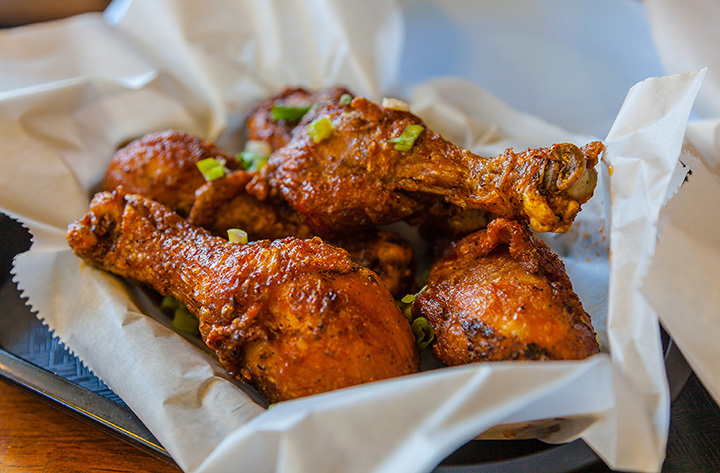 This unassuming Casper joint has maintained a laser-focus on its inimitable offering: simply great chicken wings. Hungry families, and even lone foodies, leave the establishment, buckets of chicken in hand, teetering sides and drumsticks by the pound. Sure, there’s some barbecue here, some interesting mini tacos, and other fried eccentricities, but the hot wings, in 50-150-piece incarnations, are the real draw. The hot and spicy barbecue varieties are particularly savory, sweet and with a pleasantly lingering heat. This beautiful bare-brick and pine-beamed restaurant is consistently voted best pizza in the area, if not the state. The jovial music, sports and outdoor vibe welcomes all and provides a fun eating atmosphere, a mix of locals and tourists, fun seekers all. Even if it’s not by the slice, Pinky’s wings are under-the-radar gems. They’re not earth shatteringly creative, just downright good. Simply served with the ubiquitous carrot, celery and bleu cheese, the honey mustard and simply “hot” wings are the way to go. For decades this pizza and beer, Chicago-meets-the-Mountain-West joint has pleased with an eclectic but comforting menu. For a casual, sports bar/pub atmosphere, a basket of their hand-tossed wings goes down surprisingly easy, especially alongside an icy brew. Or, for the ravenous, a “keg” of chicken may be more apt: piled high and served with handfuls of celery and carrot sticks. The list of ten sauces is unique enough to be interesting (Jamaican Jerk rub or Thai Fire sauce), while still bringing-home the inimitable classics, like Buffalo and Applewood barbecue. A truly local establishment, with loyal customers and down-to-earth service, Mr. Jim’s is always a pleasant experience, only more so when their chicken wings are involved. Though the pizza is the main moneymaker, like any self-respecting American-style pizza joint, the chicken wings are solid appetizers. The choices are minimal (barbecue, spicy or naked? ), and perhaps that’s for the best: this restaurant’s strength is its execution of straightforward, uncomplicated fare.